When this year's Met Gala theme was first announced, I was nervous. The title — "China: Through the Looking Glass" — reeks of orientalism, and I was worried that the 2015 Met Gala exhibit would celebrate Western designers' appropriation of Chinese culture and that the Gala would be full of celebrities wearing kimonos trying to look "Asian." Although most of my concerns about the Met's exhibition itself were addressed ahead of time, there was no way to know what celebrities had up their sleeves until tonight's Gala, and I was so pleased to see that most of the celebrities were able to respect the theme without offending. But most of the fashion risks taken had nothing to do with the theme itself, which was definitely disappointing. The stated goal of "China: Through The Looking Glass," according to the exhibit's curator Andrew Bolton in an interview in this month's Vogue , "is to recast Orientalism in a more positive light as ‘an exchange of ideas and an honored source of influence.'" It's a history of orientalism in Western fashion, not the history of Chinese fashion and culture, which is a subtle but important difference. 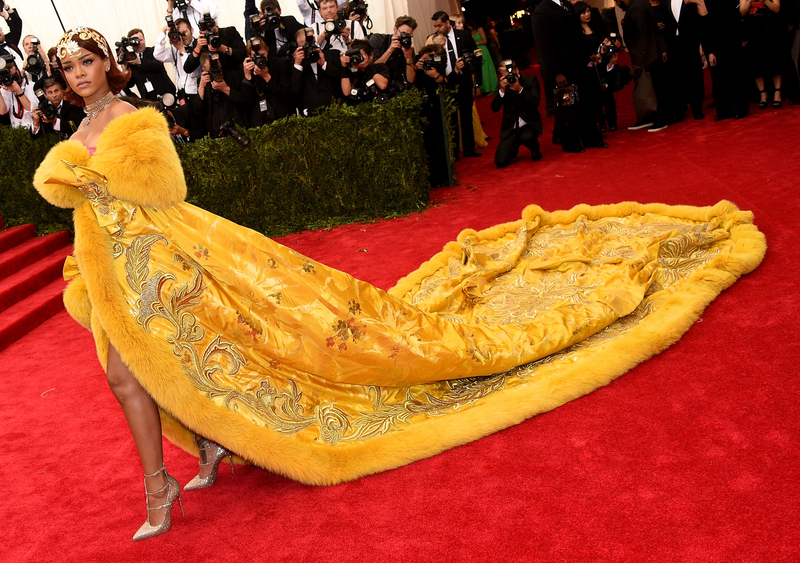 The first reviews of the exhibit are in, and it turns out the Met Gala exhibit is OK after all. Racked even described it as "surprisingly respectful." The benefit of having this exhibit at the Met is the museum's deep institutional understanding of Chinese history and culture. That background and those bona fides are how the Met is able to get away with a theme as nuanced as this without offending. I was worried that the celebrities and designers attending the Met Gala wouldn't be capable of doing this research in advance, especially given their dubious track record of dressing in theme in previous years. Take, for example, the Punk Rock Debacle of 2013 or the White Tie Fiasco of 2014. No one seemed to be able to dress to the exacting standards of Anna Wintour, Editor-in-Chief of Vogue and co-host of the illustrious event and namesake of the museum's Costume Institute, and no one seemed to understand the history of the designers or fashion movements from which they were supposed to draw inspiration. It seems that this year, designers and stylists and celebrities understood the stakes of messing up. To misconstrue this theme would risk being called racist, which isn't a label any celebrity wants tied to their name. Although it's unclear how much research was actually done beforehand, most of the sartorial references made to East Asia were actually founded in Chinese culture, although a few celebrities did have hair-sticks in buns (I'm looking at you, Emma Roberts). A couple of moments tonight made me cringe and feel like the celebrities might have missed the point. The Cut covered the red carpet on Periscope (even showing Katie Couric how to use the live-streaming app) and briefly interviewed Poppy Delevingne, who was wearing a gorgeous tulle gown from Marchesa, covered in her namesake flower: poppies. When asked about her inspiration, Poppy told reporters, "I came as opium." China has a complicated history with poppies and opium because of the Opium Wars, in which the British attacked the Chinese in two brutal wars, highlighted by that one time in 2010 when British Prime Minister David Cameron almost caused an international incident by wearing a poppy pin when visiting Chinese Premier Wen Jiabao. The dress is gorgeous, don't get me wrong. But the implication of wearing poppies, and wanting to look like "opium," is a much more complicated one than Delevingne probably thought. Other celebrities made similarly questionable choices, like Karolina Kurkova's comically sleeved red silk dress that looked more like a Halloween costume than a black tie-appropriate outfit, or Chloe Sevigny's weirdly brocaded JW Anderson gown. But, again, the Chinese influence was clear in both, albeit not perfectly executed, and to call it "offensive" would be an exaggeration. If anything, this strict hewing to and respect for the theme led to kind of a boring red carpet, and the most interesting and daring looks were not daring because of the Chinese influence but because of the cut-outs. Kim Kardashian's white beaded and feathered gown from Roberto Cavalli was gorgeous, but the only clear reference to Chinese culture was the round symbol near her belly button, signifying a type of blessing. The sheer Versace gown worn by Jennifer Lopez had a beautifully beaded red dragon, but the side-booty on display is what stole the show. Beyonce's booty-popping bejweled gown is definitely a bold look, although I fail to see how it fits in with the theme. Some dresses had no clear Chinese reference at all, like Katy Perry's spray painted Moschino gown, with an accompanying spray paint handbag, or Anne Hatheway's golden hooded short-sleeved dress. Miley Cyrus's black studded dress is more in line with 2013's punk theme than this year's. It was also disappointing to see that most of the celebrities wore clothes from European or American brands rather than take the opportunity highlight contemporary Chinese designers. But at the end of the night, my worst fears went unrealized because no one showed up dressed like a geisha! And celebs have the whole Costume Institute exhibit, the largest in the institution's history, to learn about the history of orientalism in Western fashion. I'm glad that the celebs at the Met Gala took the theme seriously, but I wish they hadn't been so scared of embracing Chinese culture and fashion. If nothing else, I can take solace in the fact that the influence of Chinese culture on and the history of orientalism in Western designs is being acknowledged on one of fashion's most important red carpets, even if there weren't many risks taken within the theme.